We should take better care of ourselves ._. +1 crunchy deep fried EVERYTHING yes. Fandom Levi is so SASSY <3 even when he's being an uke he's so dominating? and I just love it. >Girl wrapped in food ( ͡° ͜ʖ ͡°) Sounds cute. Learning cooking actually sounds like a good fun side effect!! I've been getting addicted to adding bread crumbs to everything Tonkatsu style and frying them for crispy goodness! And that's my limit of cooking skills eheh. SNS's NO.1 SEAT IS A HOTTIE <3 <3 <3 Also what a loveable dork when he's worrying about his cooking sjfgjhf Good taste fam. Soma's dad needs more airtime btw. I missed him this season. AAA I SEE THE EMOTICONS AND NOW FEEL EXTRA HUNGRY TTwTT time to put away assignments and eat dfhghj AND WATCH THEM SEASONAL ANIME!!!! Heyo, I suppose both due to the ambiguity of the question. I thought you were always addicted to food theme anime/manga. Oh did you recently get into k&j drama? How are you liking it? That's really awesome. What sort of cooking techniques have you perfected? I still garden. Speaking of which, spring is here and starting the old greenhouse back again. Wait whaaat. That's crazy. Congratulations. This is awesome. I'm so happy for you. How are you finding the new experience? It is a massive change but positive change for the long run so it will be worthwhile. LOL rip shirts ;w; Also same, spiders are kill I hope you survive. Channel your inner Levi and go on a full spider extermination-cleaning mission I believe in you!! //pat pat Nendos are just ridiculously expensive tbh. I settle for those fluffy doll things that come out from time to time. They're cute and easy on my pocket .-. I will someday own an entire Haikyuu nendo set though I swear!!! Ayyyy we're getting fat together for real LOL /o/ lets just watch a sports anime and work out alongside the MCs and burn it all off yeah? Yeah. 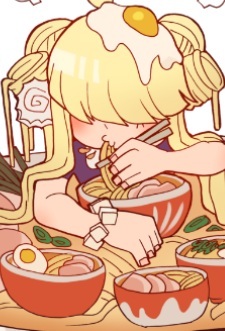 *eats noodles* TTuTT It's their fault for being so tasty tbh. Kurootsuki makes me so happy Lel my nendos are locked up in a cupboard out of my dog's reach rip. I'm salty over 10C still ;; How abrupt could that end get gah. ( ͡° ͜ʖ ͡°) I see. Sausage fest with less plot makes me think of Ten Count's later chapters. And I am so sad about that. Also yes ikr Kuroo in a hoodie just makes me want to die ajdgahsfg. His bedroom eyes and messy hair is too much sometimes. I'm doing good!! Assignments here and there but I have 2 whole days off atm so I will anime after a verry long time!! :D Kinda excited tbh.